GOODYEAR, Ariz. — Julio Urías takes the mound on a cool Friday night at Goodyear Ballpark, the Dodgers and Reds embattled in Cactus League play. Under a pastel desert sky, Urías commanded the mound. He allowed one hit while striking out three and walking one in three frames. The Dodgers went on to defeat old friend Yasiel Puig and the Cincinnati Reds 8-1 in the spring training victory. Urías isn’t a teenager anymore. The 22-year old pitcher has the stuff to be a front-of-the-rotation guy. The Dodgers envisioned Urías as a starter when they signed him, and it’s time for him to assume that role. At least for right now. It’s been almost three years since Urías made his MLB debut against the Mets in New York. There’s been a lot of ups and downs since. Urías underwent major shoulder surgery in 2017, and he only appeared in three games (four innings) in the 2018 regular season. This spring, he’s demonstrated that he’s healthy and ready to contribute to the Dodgers. On Tuesday night at Dodger Stadium, the last game of exhibition, Urías threw four perfect innings in his final tune-up before real baseball started Thursday. He was very efficient, throwing 28 of 42 pitches for strikes. This Julio Urias slider has me thinking of Blake Snell. Finding the balance between protecting their talented 22-year old pitcher after shoulder surgery and allowing for him to have a clear path to a successful future as a starting pitcher hasn’t been easy for the team. Dave Roberts told Dodger Insider that there’s “no hard numbers” as far as an inning limit on him. Urías went 2-0 this spring with a 1.72 ERA and 0.511 WHIP in six games (five starts). The lefty allowed four runs on five hits including two home runs and struck out 15 while walking three in 15 2/3 innings. Follow Julio Urias during spring training. His velocity ticked up a bit this spring, touching 97 MPH. His fastball command was sharp on Tuesday night, allowing him to use his changeup and off-speed pitches more effectively. Last year, Urías only pitched 22 innings. This year, he was set to start the season in the minors to prevent him from racking up too many innings before needing him in the second half and into the postseason. Roberts said saving Julio Urias’ innings for later in the season is a goal. Dave Roberts said Rich Hill has a left knee medial collateral strain, most likely to injured list. Ryu starts opening day. Stripling starts Game 2. Julio Urias might start instead of relieve. The Dodgers originally planned for Urías to start the season in the minors. As spring training progressed, Clayton Kershaw and Walker Buehler‘s slow springs opened the door for a healthy Urías to get innings at the major-league level earlier than anticipated. With Hill on the IL to start the Dodgers’ 2019 campaign for a third consecutive World Series appearance, the door is wide open for Urías to pitch in the starting rotation. Tony Cingrani will also start the season on the injured list, opening up a spot in the bullpen as well. The final spot goes to Brock Stewart. Having a guy who can go multiple innings out of the pen was important to Roberts. The Dodgers slot Ross Stripling into the rotation to start the season as well. Stripling is known to have strong first halves, only to tucker out in the second part. Last season he went 8-2 with a 2.08 ERA and 1.080 WHIP in 25 games in the first half, but he struggled in the second half. Chicken Strip went 0-4 with a 6.41 ERA and 1.575 WHIP in his last 8 games in 2018. When Stripling got into the starting pitching conversation, once it looked like time was running out for Kershaw and Buehler to be ready for Opening Day, the plan for Urías was to pitch some innings out of the bullpen. This would limit Urías’ innings, but still allow him to get some multiple-inning outings as a long man out of the bullpen. Baseball rosters are an ever evolving and revolving collection of players. Urías should get his shot at doing just that. Urías started 15 games in 2016, and then five in 2017, but season-ending anterior capsule surgery on his left shoulder kept him out over a year. He only pitched four innings during the 2018 regular season but still made the National League Championship Series and World Series rosters for the Dodgers. Stepping up in the postseason, he allowed two runs on four hits with five strikeouts in seven relief appearances (6.1 innings). The southpaw has pitched in relief in six career games, striking out 14 batters in 11.2 innings (10.8 K/9). 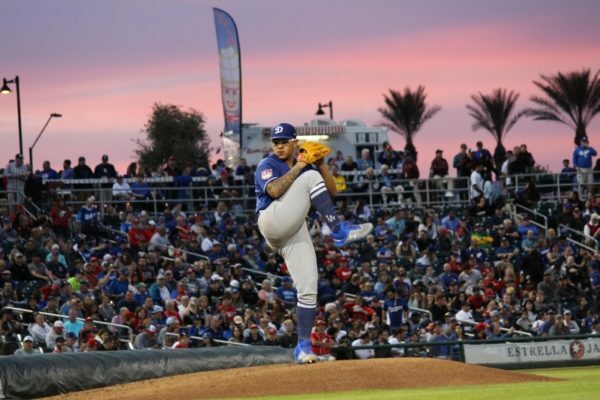 The Dodgers intended for Urías to pitch out of the bullpen for the first few months of the season to preserve some innings, getting him back into the rotation in the second half. It seemed like a decent plan, but then again you can never plan for everything. As of right now, Urías looks strong and will be needed to pitch some innings early in the season until Kershaw, Buehler and Hill are healthy and built up. Urías has been shuffled around, shut down, stashed in the bullpen, and given major-league starts. The constant changes to his routine are questionably detrimental to his development as a starting pitcher, a role he will now step into for the start of the season. It’s understandable to have some sort of innings limit on him, but it’s about time Urías has the opportunity to continue to develop into the starting pitcher he is meant to be. It’s sooner that what the Dodgers wanted, but Urías will get the opportunity to prove he’s ready to open 2019. Urías starts the fifth game of the year for the Dodgers on Monday vs. the Giants. It’ll be his first start in nearly two years.